Intention: To heal areas of my body that have caused me discomfort/pain chronically to include my anxiety, sinusitis, chest tightness, acid reﬂux, pain in my ribs and solar plexus area, jaw tightness, and muscle tension, pain, and/or heaviness in my neck, shoulders, legs and feet. She was moved to create a tender, loving, supportive Grandmother energy who would always have her back and who loved her unconditionally. She had created several SoulCollage® and paper dolls with this energy and even named a “Council of Grandmothers” to include Grandma Madge, Grandma Millie, Grandma May, and Grandma Mable, each with different life stories and energies. This doll has energies of Mable and Millie. She used the body of a stuffed snowman that she used when she had taught baby sign language. First, she cut off the snowman’s head. The center of the body was made from a slinky and was hollow, so she added a plastic heart with a “diamond” and a plastic Mardi Gras King Cake baby to the inside. This symbolized the Grandma Guardian’s big heartedness and her unconditional loving of as well as Tamara’s connection to her “Inner Child”. 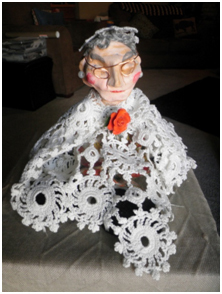 She covered the doll’s body with a doily, added a rose earring, sculpted the face out of clay, painted it, added grey yarn curls, makeup, and pearl earrings, and put a doily hat on her head as well as wire glasses on her face. 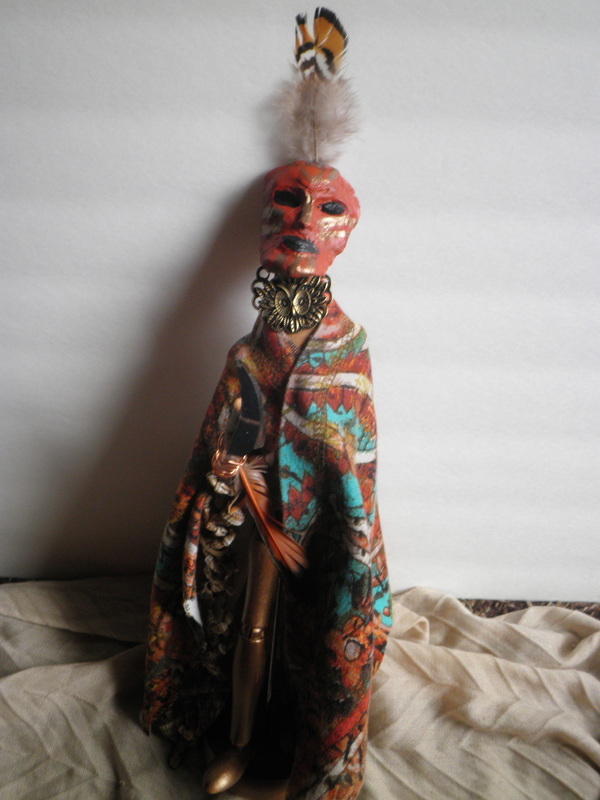 This guardian is a ﬁerce, masculine protector that Tamara created out of a clay mask that was placed on a doll form on a stand. She added a robe made out of an old shirt, an owl ring for an amulet, and created a lance with a stick, a ﬂicker feather, a seashell necklace, and glass piece. The masked warrior is ﬁlled with mysterious medicine man energy and is unnamed. She started with an extremely heavy rock and added a face created from a necklace. She painted a big, fake, red smile over the warrior’s grimace, and added prickly balls (from trees in Mexico) to represent her arms/hands and legs/feet-areas of chronic tension. 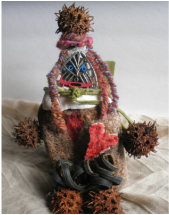 She put a handcuff bracelet around the neck, added a prickly ball on it’s head to symbolize her irrational beliefs. There is a black “snake-like” object at the belly area...something Tamara found on the ground at a Rosh Hashanah celebration in the mountain years ago. SheI painted a red esophagus in the shape of an inverted tear and added a heart-shaped rock , put red tears on it with a marker and then glued a series of yarn “cords” all over the body, mostly emanating from the head and heart. These “cords” represent “dread locks” (notice the spelling-it is intentional). Until I added them, I thought my Scapegoat was ugly and hard to look at, after that she looked inﬁnitely cooler but still foreboding. She placed a green sack of heavy rocks on her back, each representing a burden that I have carried. She called this her “baggage” or her “S” cape. She felt that releasing them was her only avenue of escape. She then placed “Bertha” on a stack of dark shadow SoulCollage® cards that I have been creating since 2007. ....also felt moved to create. ​The Inner Healer - “Anam Cara”....Soul Friend in Gaelic. Tamara’s Inner Healer’s base was going to be a blue vase; however, she decided to use a pillar candle to build her on which symbolizes her inner light. She added other touchstones within the candle for her to hold the energy for including a metal charm with the word create, a heart rock, a sea shell, a crystal, a feather, a green and crystal marble, a clay moon face, a metal sun, a game token, and a pink button (to represent ancestral wisdom-it belonged to my great-great aunt). She used an old curtain from my daughter’s bedroom with a blue ribbon to create her robe and hood. She molded her face with a clay mold and added extra clay to carve spirals into with an old earring (which she attached to the right side with a peacock feather). For Tamara, this balances the right side by adding feminine energy. She painted her face bronze metallic and purple and added lime green glitter. She found a small, hand-beaded purse at the thrift store that had small crystals inside, so she added that to her shoulder. The sheplaced a lime green butterﬂy (for vibrancy, vitality, and growth) on her forehead. Years ago Tamara chose this name to represent my highest). She found a wooden, drawing model form to which I added a clay face with paint and glitter, a ribbon for her head, a crystal costume jewelry earring she inherited from my Great-Great Aunt to symbolize her heart, a feather skirt, a cape created out of an orange cloth napkin and a “mantle” that is beaded and was a necklace. She placed a metal butterﬂy ring around her neck so that she has butterﬂy wings at the base of her neck/top of her back in the area of her ﬁfth chakra (throat-where her inner voice emanates). She is holding a metallic orange yarn thread to represent the new stories she is spinning as she claims her wholeness and restores her Soul Essence. 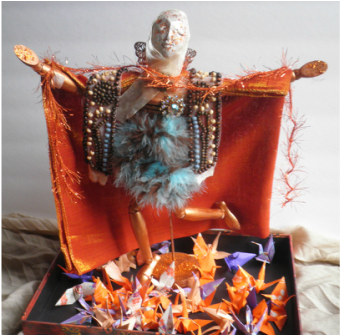 She then placed 50 handmade orange and purple cranes of peace (origami) at her feet. She spray painted the form copper and added glitter to the bottom. There is a small blue charm with the word “Acceptance” under the feather skirt. Tamara’s chosen word for 2014 was acceptance, and now my Talisman has a belly ﬁlled with it! When I look back at the SoulCollage® cards I have created since 2007, there are many that embody the energies of these four dolls. I also started making paper dolls some years ago and have several of those that depict the guardian, healer, wounded, and talisman/healed energies. I have also created a lot of cards that have different depictions of dolls in general. 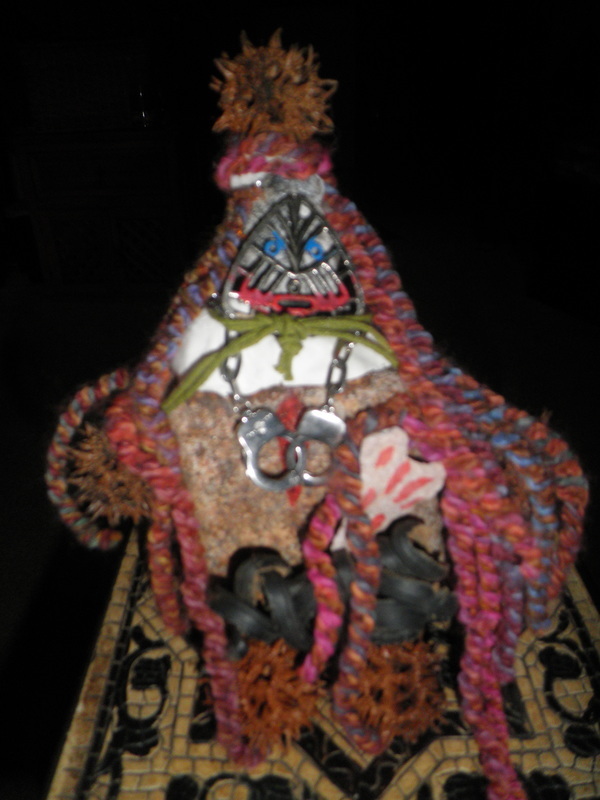 I started to create “Spirit Dolls” l July 2013 and quickly birthed about 20 of them. They came from found objects...mostly natural things like wood, shells, leaves, moss, etc. In looking back on them, I could see that many ﬁt into the four types of medicine dolls that Barb was encouraging us to create. My creative process happens to be a lot of percolating and then a ﬁre storm of chaotic creation that happens fast and furiously. This time was no different. 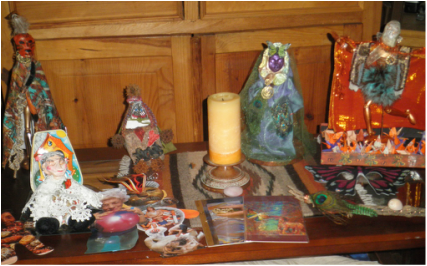 I visited Cat Caracelo in her home, and she shared her medicine dolls (she has taken Barb’s e-course). I came home and birthed these four in four days. They were all created from objects I already owned and repurposed except for the grey yarn used for Grandma Mable’s hair. I created the Scapegoat and Talisman somewhat simultaneously, and then followed with the Guardian and Inner Healer. Step One: Create an altar and light a candle to start the ritual. Step Two: Remove the “S”cape off the Scapegoat, remove the rocks, and throw each of them into a moving body of water while reciting what burden they represent and what I am releasing. When I have released all of the burdens (rocks), I will tie the “S” cape back on. The “S” has transformed from meaning scared, self-obsessed, and self-sacriﬁcing to strong and soft, serene, and sacred self-care. Step Three: Take a ritual, salt and lavender bath to cleanse the old energies. Step Four: Look at all of my shadow SoulCollage® cards and select those who can be “retired” to my archived SoulCollage® deck. Step Five: Build a bonﬁre and put paper with what I am claiming into the ﬂames to send the energies to the Heavens. Step Six: Look at the SoulCollage® cards I have created representing a “lightness of being” and “claiming wholeness” and feel each of those energies in my body. Step Seven: Dance spontaneously creating the energies of my journey and traveling through the Guardian, Scapegoat, Inner Healer, and Talisman embodiments. ​Step Eight: Create a piece of art depicting this journey. Step Nine: Read a writing describing the energies you are claiming. Step Ten: Write a poem about this stage of my journey. Step Eleven: Listen to deeply moving music in a meditative state.